The article writing and marketing industry is a global community made up of people from hundreds of different countries with almost as many different languages. In fact, EzineArticles Expert Authors come from a total of 230 different countries, territories or islands. In a perfect world, we would have a section of the site devoted to each different language spoken by our authors. However, supporting each language would mean we’d need a full complement of editorial staffers who speak each individual language in order to provide our current high level of member service. As a result of this logistical challenge, we are currently only accepting articles written in English. That means you have to know and understand our Editorial Guidelines, speak the English language and then be able to write high-quality articles. Implementing a successful article writing and marketing plan can be difficult in itself, but it’s even tougher if English isn’t your primary language. To remedy that, I’ve gathered some “Do’s” and “Don’ts” for non-native English speakers to follow as you implement your article marketing campaign. Use a Translational Dictionary – The translational dictionary is an important tool for the process of learning English. When questions arise regarding proper English words and usage, a dictionary can give valuable information for making the right choices. Using it often is essential to mastering the language. Strive to Understand Basic Grammar Rules – One of the common grammar problem areas is plural vs. singular versions of words. (For example: “penny” versus “pennies”, “this car” versus “these cars” and “deer” versus “deer”). And there are many others. Try reading simple English stories as practice. Immersing yourself in the language will help you build your vocabulary, understand how to use that vocabulary and improve your grammar. Ask For Help – We strongly suggest that you have any written content proofed by someone who has English as their native tongue (or is extremely fluent) before submitting your articles to us. This will increase your chances of getting each article approved on the first submission and help you learn. Stay Consistent in Dialect – Be aware of British and American spelling differences. We accept both, but stay consistent in the dialect you use through each article. Don’t Trust an Article Translator Program – They may seem like the best option, but computer programs may not capture the nuances of the text you’ve written. Again, seek the help of a friend that has a better understanding of the English language to help you through the translation and reviewing your article. Don’t Link to a Site in Another Language – Only link to sites that are in English. Linking to a non-English site when your article is in English doesn’t make sense to us or to your readers. Don’t Forget Punctuation – Check that you’re using punctuation correctly. For example, put commas where they are necessary, but don’t overuse them. And remember to always put a space after any end-of-sentence or mid-sentence punctuation like periods, exclamation points, question marks, commas, colons and semicolons. Use these “Do’s” and “Don’ts” when writing your next set of articles to significantly improve your chances of first time approvals. Also, take a minute to share any of your own tips for others. You are right. Article Translator Programs are a disaster. I tried them with no good result at all. Wonderful tips, very educational. Thank you. Yes, penny I agree with your words. That’s right….! I would also add that try and keep paragraphs short and concise and even organise many of your main points into bullet points. Personally I always prefer to read articles in bullet point format rather than big blocks of text. As a translator and editor with 11 years’ experience under my belt, I would warn non-native speakers that there are plenty of native speakers whose writing skills are horrible and who cannot be relied on to edit any text. Obviously it won’t be easy for you to determine how good your friend’s written English skills are, but try your best to find out! Thank Ma’am for these guidelines… A blessed day. your tips are always useful for me , anytime if i got any problem to write article always I recalled your tips. We’re calling attention to the plural version of “deer” which is “deer” … not “deers”. Sorry for any confusion! I think that anyone who does not have English as their first language and attempts to write an article, in English, is very brave. I would not like to see what a mess I would make of a foreign language. Sometimes though, articles written by foreigners have a charm of their own. Thanks for these helpful tips. English is not my native language but I only write in it. I do not write in our national language. It is too complicated a language for me to write in. Since English is a global language, I think everyone should learn it and you made a right decision not to accept articles in other languages. Even here in the Philippines there are places where the speakers can only understand each other if they speak in English. Too bad we were colonized by the Americans for good. I have no problem with high standards for the articles. My problem is with not accepting links to websites that are not in English. I know that you can argue about this, but of course a case can be made for this policy decision. I would just like to point out that for me a lot of the interest of having articles published in EzineArticles disappeared the minute I had to erase all traces of links to my website that is in Danish only. Great article. I think people who do not speak English as a first language should hire people to write for them if the article is for business purposes. Non English speaking site owners should consider paying a professional to do the writing for them. So, what do you do if you want to write, and keep, the article in another language? From what I understand that is not possible. Am I correct. Mats, you are correct. 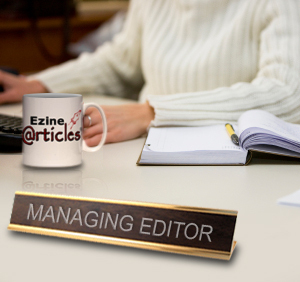 All articles submitted to EzineArticles need to be in English.